It was my privilege to attend the dedication of Morrison Christian Academy's new library on April 24, 2009. 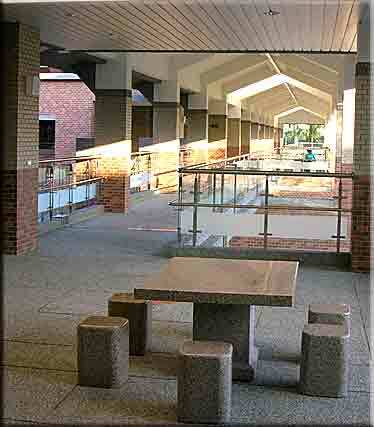 This was one phase of a major reconstruction of the school, a campus that was built in 1971. A month earlier, the new elementary school was dedicated and is now in use. 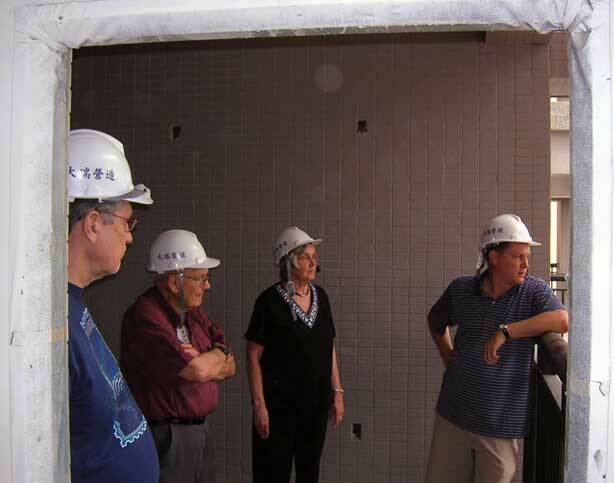 At the end of August, 2009, the new student dormitories and faculty housing will be dedicated. The next two pages will be devoted to pictures of the new campus and the dedication of the Charles and Betty Holsinger Library. The third page shows some street scenes of Taichung, Taiwan, with a heavy emphasis on street food. The new school entrance is a vaulted glass foyer. The business and principles' offices are to the right, and the new dinning room and library to the left. One passes straight through to the central school plaza. The new housing building sits in what used to be called faculty row and has replaced perhaps half a dozen houses that were there. The four dormitories, seen inside the red oval, use the same model for housing boarding students that the school established in 1971. 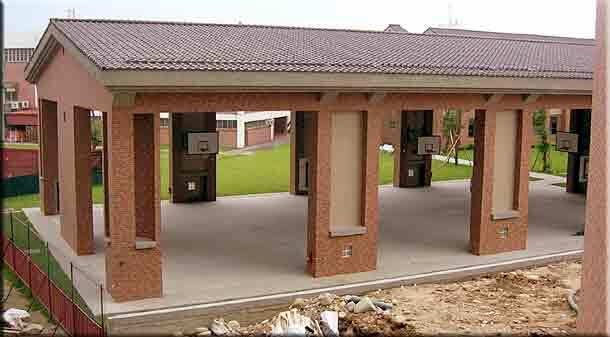 Each dorm is coed, with approximately 8 boys and 8 girls, who live with a host family in that dorm. If siblings are boarding at the school, they live in the same dorm. Only high school students board. 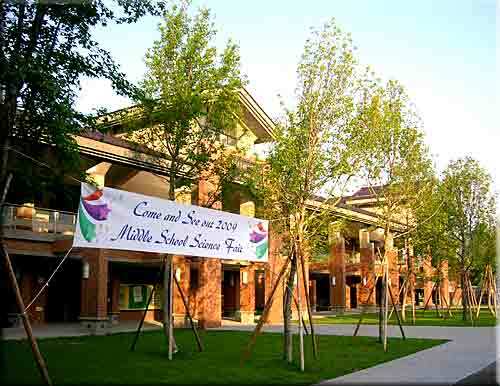 With Morrison elementary campuses in Taipei, Taichung and Kaohsiung, students through 8th grade attend day school. Living away from parents is stressful in the best of conditions, and the school has found that by using carefully selected host families, and keeping the setting as family oriented as possible, the students develop a real bond with the host family and many alumni look back on their dorm experience with great fondness. Each dormitory has two hallways, one for the boys and one for the girls, with two students per room. 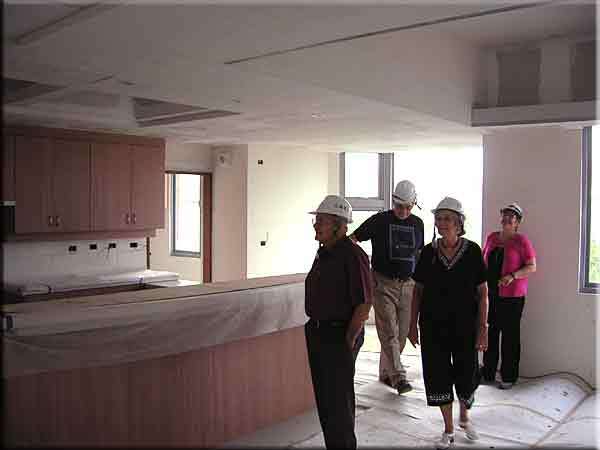 A spacious central area has a large kitchen, where the students help prepare meals and clean up, as they would at home. The great-room is a center of activity, and also where all internet access is located. Adjoining the great room is the condominium where the host family lives. The hosts are committed, however, to being available and spending their time with the students when they are home from school. 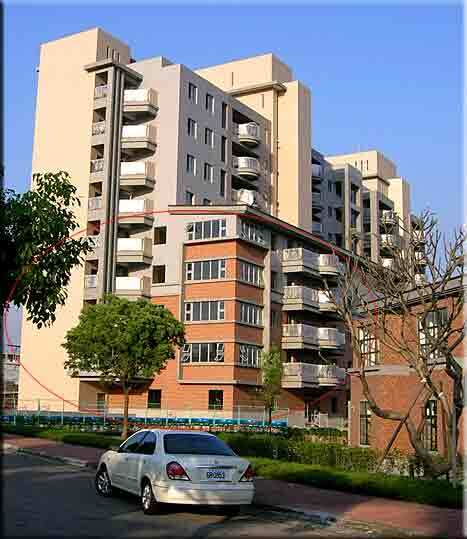 The faculty condominiums have two, three or four bedrooms and are allotted based on the family size of the teacher. Each has a modern, open kitchen and spacious living and dining areas. The concept is to make it as easy as possible for faculty to entertain in their home, either students or others in the community. Looking left from the foyer is the new housing building, with four dormitories (inside red oval), and 26 faculty condominium units. To the far right are the dining room, lower level, and the library, upper level. Paul "Pep" Peterson, Charles "Coachie" Holsinger, Ilene Peterson and Robyn Holsinger Ektrand. Capturing the moment with Director of Planning, Bruce Moore. Coachie Holsinger built the existing campus on this property in 1971 in the capacity of School Superintendant. Examining the first kitchen installation. 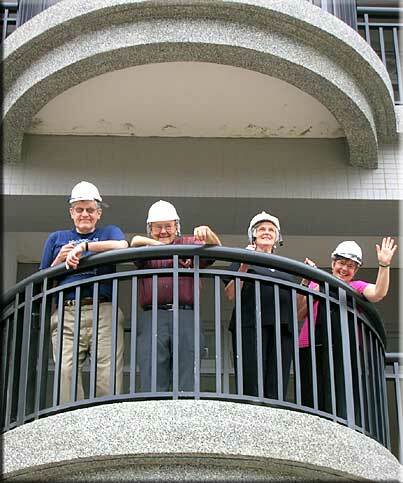 Thirty-eight years of moisture, typhoons and weathering made it necessary to rebuild the elementary school. It was this immediate need which drove the the rest of the building project. Great care was taken to plan the building so as to incorporate every foreseeable need into the future. This is particularly true of a concrete building as modifications later are nearly impossible. What resulted is as beautiful as it is functional. Students have broad covered passageways to stay out of the rain. A covered athletic court is a new feature for the elementary school. The classrooms are wired for internet, have digital projectors and may soon incorporate smart white-boards. Stepping into the school plaza from the foyer, the elementary and middle school is still on the left. The Middle School wing looking from the gym. The upper breezeway, connecting the wings. The marble picnic table came compliments of the builder. includes after-school organized sports for elementary and middle school students. 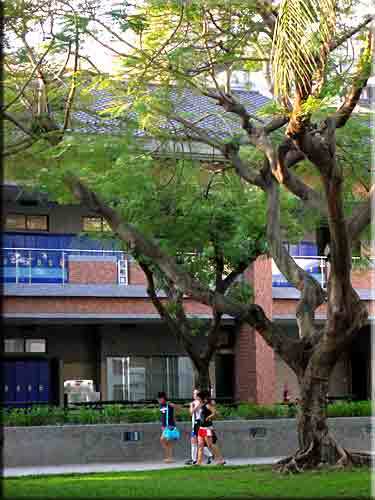 Teams play intramural as well as against other youth teams in the Taichung area. 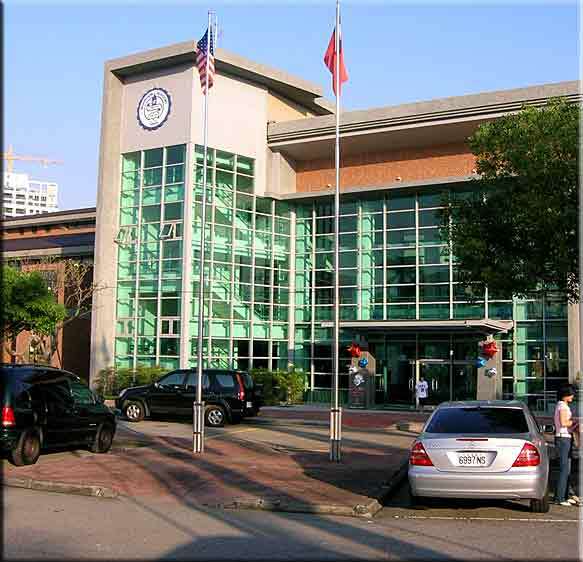 Originally, the library was to be built as a separate building, however, as the cost of commodities skyrocketed in 2008, the plans were modified to incorporate the library into the Elementary School structure. It proved to be a win win decision, as the wonderfully open plaza in the center of the school remained intact and the quality of the library was not compromised. Glass study and presentation rooms divide the library down the middle, allowing the High School to be separate from the Middle and Elementary school sections. Looking left from the entrance, a group study room is glassed off. Looking down the right side of the library. 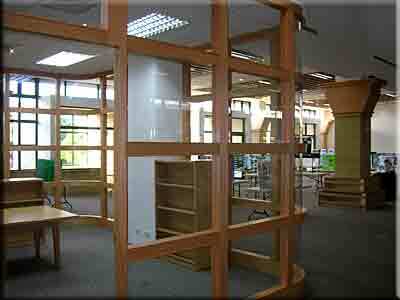 Quiet presentation rooms are separated by glass. 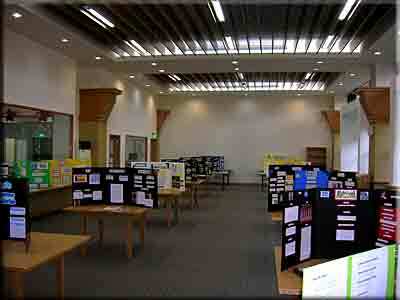 The Middle School Science Fair was in progress. The library is upstairs, the dining room downstairs. An elementary wing is to the far right. 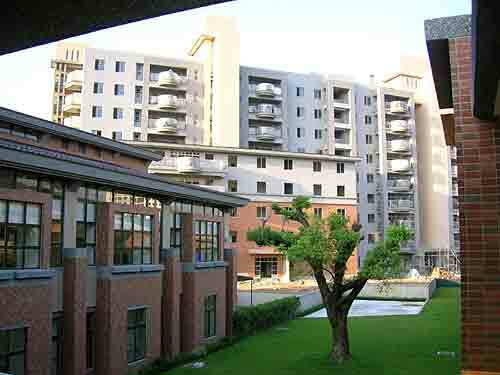 In the housing building, the dormitories are the four floors in the foreground with the faculty condominium units above and to the right. Chuck Holsinger Autobiograpy: Above the Cry of Battle His story of ferocious combat in the Philippines in WWII and how the Lord lead him from there. Robin Dale: http://robinhoodshow.com/ Composer, performer, uses strong rhythm, tribal percussion, and lyrics which convey a respect for his adopted Taiwan. Don's Home Page: www.jali.net Mostly travelogues, including Taiwan, China, Cambodia, Laos, Tuscany, the Morrison 2002 Reunion and Morrison Cruise.